Our Rochester regional headquarters is located at 3 City Center, Rochester, N.Y. Locally, our customers bank with us at 30 offices across five counties, including: Livingston, Monroe, Ontario, Wayne and Yates County. 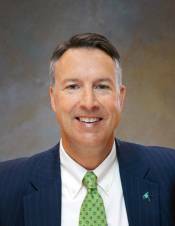 Dan Burns serves as Senior Vice President and President of M&T Bank’s Rochester region. Burns joined M&T 33 years ago as part of the bank’s Management Development Program. Since then, Burns has held numerous positions within the bank, and in 2004 became regional president. A lifelong resident of Rochester, Burns serves on the boards of the Greater Rochester Chamber of Commerce, Monroe Community College Foundation, St. John Fisher College, United Way of Greater Rochester, University of Rochester Medical Center and the YMCA of Greater Rochester. He also serves as board chair of the Greater Rochester Enterprise and co-chair of the American Heart Association’s 2019 Rochester Heart Walk & Run. Burns earned a bachelor’s degree in Finance from St. Bonaventure University and a Master of Business Administration (MBA) from the Simon School of Business at the University of Rochester. He and his wife, Denise, have three children and live in Brighton, N.Y.